In the early days of manned flight, people generally had no clue what they were doing. If two wings could make the contraption fly, more wings must make it soar, right? Our friends at Oobject have assembled 15 of the most grandiose, excessive, and redundant aeroplane wing designs of all time. His first manned machine, the 1904 multiplane had 21 wings and looked the most conventional, of the three machines he created. The last of three flying machines built by Phillips, the result is more like a wooden framed building than an aircraft, yet Phillips was the first person to truly understand that science of flight. The Roshon and Marquis d'Equevilly multiplanes are considered among the "classic" multiwing designs to emerge from this era. A century before the Osprey became a reality, French aeronauts were already fooling around with the idea of a tilt-rotor design. This multiwing monstrosity was constructed in Queens NY between 1912 and 1913. The design was later adapted to a single wind design, known as the Huntington Clam. This 9-wing, 100-passenger prototype was supposed to usher in a new era of Transatlantic flight. During the initial test flight, the plane made it a whole 60 feet into the air above Lake Maggiore in Italy before slamming into the water and breaking apart. 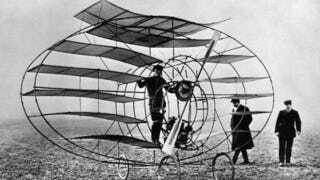 The first human powered aircraft. And thankfully the last.